It's the 351st World Martial Combat Tourney and you must defeat 9 of the toughest warriors in the most deadly style of all - rock, scissors, paper. Click here to play! These Ultimate Fighters have trained for years, honing their skills to perform steely hard rock maneuvers, razor sharp scissors techniques, and wafer thin paper death blows. It won't be easy to defeat them all. Are you a bad enough dude to save the golden Buddha from the hands of evil Ultimate Fighters? Fight against the Japanese/Scottish ninja Duncan Yoshimatsu; the famed boxer, "Sugar" Sweets Candyman; generic karate guy, Hugh Manfighter; the demure yet deadly assassin, Rosechainsaw; the wise old Master An Koman Dah; the pigtailed kung fu expert, Max Sassafras; the obligatory sumo wrestler, Ryo Takanawa; Thai boxer from America, Abraham Washington; and of course, the most dangerous female ninja in the world - Knife Kate. Line three symbols of one fighter to take them out and receive the fight purse. 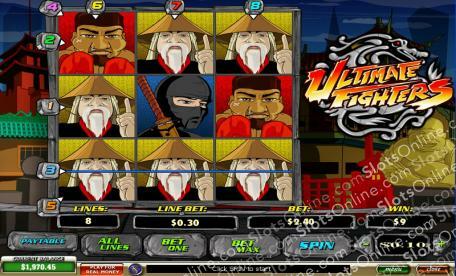 Take out the ninja Knife Kate and you can win up to 5000 times the line bet. Find out if you have what it takes to beat all of the Ultimate Fighters. Dragon symbols are scatter symbols. 4 onscreen pays out 5 times the total bet. 5 pay out 10 times the bet. 6 payout 50 times the bet. 7 payout 200 times the bet. 8 payout 500 time the bet. 9 dragon symbols onscreen, every reel, pays out 1000 times the total bet. The bonus game is triggered by three golden Buddha symbols on the one payline. In the game, you play scissors, paper, rock over three rounds. Every round won multiples the line bet by 8, every round that's a draw by 4, and very round lost is simply double. The maximum bonus that can be won is 8 times 8 time 8, which is 512 times the line bet.